Below you’ll find a full list of winners in classical music categories from last night’s 50th annual Grammys. Of local interest is news that young Charlotte cellist, Kendall Ramseur, who now studies at the North Carolina School of the Arts, was chosen to be in the ensemble that accompanied performances at the Grammys by Lang Lang, Herbie Hancock, Alicia Keys, Josh Groban and Andrea Bocelli. 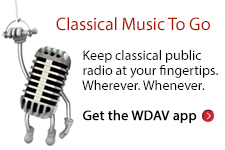 Kendall performed for WDAV’s The Main Street Sessions last March. We’re proud of him! A full article about Kendall and others from the NCSA who performed at the Grammys is here. Click here to read the article that appeared in The Charlotte Observer. conductor; Tim Handley, producer; Tim Handley, engineer/mixer (Nashville Symphony). Orchestral Performance: “Tower: Made in America,” Leonard Slatkin, conductor (Nashville Symphony). Producer of the Year Classical:, Judith Sherman. Engineered Album, Classical: “Grechaninov: Passion Week,” John Newton, engineer (Charles Bruffy, Phoenix Bach Choir & Kansas City Chorale). Opera Recording: “Humperdinck: Hansel & Gretel,” Sir Charles Mackerras, conductor; Rebecca Evans, Jane Henschel & Jennifer Larmore; Brian Couzens, producer (Sarah Coppen, Diana Montague & Sarah Tynan; New London Children’s Choir; Philharmonia Orchestra). Choral Performance: “Brahms: Ein Deutsches Requiem,” Simon Rattle, conductor; Simon Halsey, chorus master (Thomas Quasthoff & Dorothea Roschmann; Rundfunkchor Berlin; Berliner Philharmoniker). Instrumental Soloist(s) Performance (With Orchestra): “Barber/Korngold/Walton: Violin Concertos,” Bramwell Tovey, conductor; James Ehnes (Vancouver Symphony Orchestra). Instrumental Soloist Performance (Without Orchestra): “Beethoven Sonatas, Vol. 3,” Garrick Ohlsson. Chamber Music Performance: “Strange Imaginary Animals,” Eighth Blackbird. Small Ensemble Performance: “Stravinsky: Apollo, Concerto in D; Prokofiev: 20 Visions Fugitives,” Yuri Bashmet, conductor; Moscow Soloists. Classical Vocal Performance: “Lorraine Hunt Lieberson Sings Peter Lieberson: Neruda Songs,” Lorraine Hunt Lieberson (James Levine; Boston Symphony Orchestra). Classical Contemporary Composition: “Made in America,” Joan Tower (Leonard Slatkin, conductor; Nashville Symphony Orchestra). Classical Crossover Album: “A Love Supreme: The Legacy of John Coltrane,” Turtle Island Quartet.